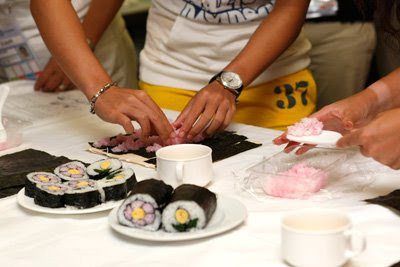 Marion Bartoli, Nadia Petrova and Chuang Chia-Jung attended a sushi demonstration and tasting in Tokyo. Here are the photos of the event. Chuang Chia-Jung, Marion Bartoli and Nadia Petrova learn how to make sushi from a Japanese sushi chef. Nadia Petrova tastes her self-made sushi. Chuang Chia-Jung and Marion Bartoli still haven't get their sushi into their mouths. Chuang Chia-Jung is not even biting her sushi. By the way, based on the Toray Pan Pacific Open Tennis tournament results today, Petrova won the second round after beating Ana Ivanovic 6-1, 1-6, 6-2. Bartoli lost to Agnieszka Radwanska 2-6, 3-6. In the women's doubles, Chuang and partner Su-Wei Shieh made it through to the semifinals in a walkover win against Maria Kirilenko and Flavia Penneta.